Most of the members of the Ontario Steelheaders are aware that I was stepping down as fisheries contact and the Saugeen head of our fisheries endeavors. I said at the start that 10 years would be the limit of the stay and that came about this past spring. Between the Steelheaders and the Lake Huron Fishing Club we achieved more than just success. In my opinion at the present time you have the finest steelhead fishery anywhere east of the Rocky Mountains. It is there because of three important reasons. 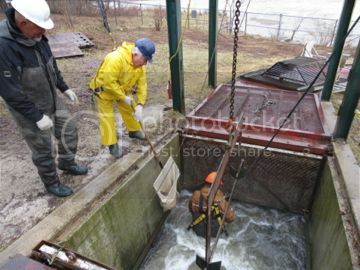 Al Wilkins and his staff at the two hatcheries raise the finest fish coming out of any hatchery I've seen, the annual adult fish transfers to the Beatty Saugeen and the word 'Volunteers'. In the last ten years, we've seen fishways improved and a new one constructed. The object was to get the fish up into the South Saugeen, which, except for the Otter are probably the only two systems capable of producing. When I got involved, we doubled the transfer numbers to moving 500 autumn adults and 1,000 spring adults. The payoff has been amazing. Working with Grant McAlpine and his crew we put the Denny's trap down for little more than an hour and in that one-hour collect between 200 to 400 fish. In three or four intensive workdays we accomplish our goal. Remember we can only take a total of 150 fish at a time in our three tankers, which can only carry 50 fish each. Two lifts a day 300 fish total. In the meantime Grant and his boys are left to handle and check the remaining fish. Thousands of fish are running through and attempting to get upriver on their own during the twenty hours that the trap is out of the water. Now think about all those remaining days when the fishway is open and operating. From mid September around the clock til late spring, rainbow are pouring into the Saugeen. In the last 10 years I've never seen a fishery explode like this. Observe the numbers of anglers that now come to the Saugeen. Think about the 40 miles of water upstream to Walkerton that are open til December 31st. In the big picture. Now, I've been around a few years, did a little simple math and put the annual run at over 30,000 returns annually and a high of close to 50,000 fish. A lot is going on under the surface that no one ever sees. Water temps tell us that the main Saugeen below Walkerton is not conducive to great steelhead reproduction. If it were, we wouldn't need the hatcheries or the bi-annual transfers. The main river and the North Saugeen are just too warm. Hatching trout need to spend a year or more in the river. Summer temps in the main and even spring temps in the North Saugeen are lethal. When I took on the program, I looked to the Beatty, which is some of the finest 35-40 miles of cold-water trout habitat in the country. As a matter of fact it's perfect. An old professor by the name of Doug Dodge studied the system years ago and estimated the Beatty was capable of producing 1 million steelhead smolts. In the ten years of increased transfers the Ontario Steelheaders have been almost left alone without MNR interference. We charge the MNR almost nothing for our efforts. 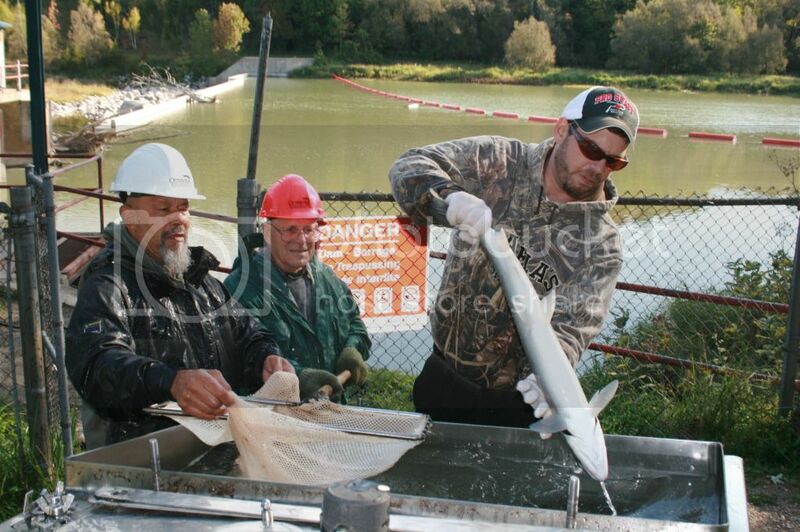 The fish are moved around the Walkerton dam and the lethal power plant at Maple Hill. Now remember 'wild' smolt in the Beatty are special. They have a year or more to take on wild traits. Until Maple Hill is either removed or a decent fishway is installed, we hope that a good percentage of the 'wild' smolts can navigate around the turbines when water heights are suitable for them to go over the dam and away from the deadly turbines. For the last few years with the fishery exploding we've noted a return of approximately 50 percent each, 'wild' versus our hatchery stocks. In the meantime I personally don't believe any fish per say are going through the recently installed Maple Hill fishway successfully. I've sat beside the fishway and counted more than a hundred fish enter the bottom step in less than an hour and never, ever witnessed one fish jump over the top and head upstream. By the way it's designed without a passage notch in the top (which is essential for a working fishway) and if they are getting through they have to jump and be seen. After 5 years of running water through it I've never seen a single fish clear the top. There are absolutely no controls at the top of the fishway to control or direct water through the fishway. 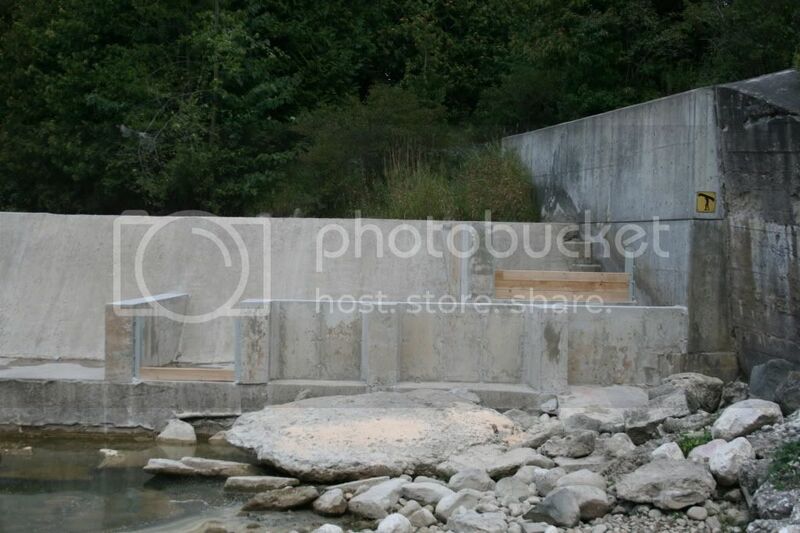 Even during normal flow, water goes over the dam and through the fishway one day with fish entering, but not getting through a day or two later because the fishway is bone dry. I was asked by on Acting Fish and Wildlife Director to be a little more politically correct. Well, I’m out of the program now and will gladly state the new fishway doesn’t work and can best be described simply as nothing more than a ‘botched abortion’ and nothing more than a waste of time, money and another impediment to upriver bound rainbow trout. This past spring after years of inviting MNR officials to visit the entire operation from Denny's, to the hatchery, to the two dams and then to the Beatty, I finally had one Provincial Fish and Wildlife Director accept the invitation. 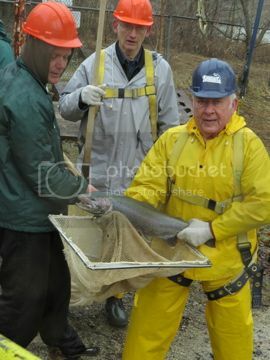 He brought along the head of fish culture, the Upper Great Lakes Manager and Shaun Carey, the area’s District Manager. They all seemed almost in awe of the work being done by the volunteers, the Denny's operation, and the Kincardine hatchery. When we arrived at the Walkerton fishway I mentioned the importance of slots and constant supervision to keep the proper water boards and V-notches monitored to allow ease of fish passage. When we arrived at Maple Hill the fishway had no water whatsoever flowing through it and two adult bows were trapped in the second step. They saw first hand the uselessness of this so-called 'new' MNR construction. This meeting took place the last week of April, just days prior to the 'ceremonial' opening of trout. Ninety-nine percent of the river was directed straight to the turbines on the opposite of the river and less than a trickle going down the 'new' fishway. I commented to group that, yes there was an old, ancient, smaller fishway across the river near the turbines, but it was interesting that no one seemed to want to go have a look???? Next we drove to the Beatty and surprise, surprise, adult bows were jammed and spawning everywhere in cold clear water. Jeez, it was right where our transport trailers had taken them...perfect spawning water and perfect rearing water. Now, a little more than two years ago, the MNR approached me and noted they wanted the transport program cancelled for a five-year study. If you know the MNR you realize they have the final say regardless of what the clubs want or feel is right. Our program would be shut down whether we agreed or not. I asked at the time why would they even think about stopping the program?? ?...NO REAL ANSWER, except in my opinion only to experiment. I also asked for a guarantee that we were allowed to start the program back up at the end of the five-year experiment. At the time I had the understanding that this would happen. Over the following months I tried to get this on paper with no reply...Now I find out that around the office, word was I was never had that agreement...Well I guess they can say I'm lying, which to me is just the way government works. Now, here are a few questions. -Why try and fix a wheel that isn't broken? - Why jeopardize a program that is providing tens of thousands of fishing hours and one hell of a lot of dollars to the local community? -Why stop a program that isn't costing the MNR or anyone else money, except from the pocket books of the volunteers themselves? -We see the vast improvements in a Saugeen steelhead fishery, which is one of the best in the country today? Easy to answer. They want to experiment! Remember this one. They wanted to try and cross a brook trout with a lake trout so that they would hopefully have a faster maturing fish than a lake trout that would escape the destruction of the lamprey eel? Yes, we caught some, but at what expense? For years I watched this folly, sat on government panels and watched and listened as the program floundered and the MNR pumped out their propaganda. It hurt to watch some biologists that were trying to explain that the program wasn't working an proved a failure. It took 20 years for the scientists and biologist to finally admit it was a dud, even though many of them told these same 'experts' that it was a dud from the start. At our meetings a few of us recommended changing the goal back to true lake, only this time utilizing eggs and brood stock from Lake Superior that were proven winners. Guess what they are doing today? This one is worse than every other experiment. Since 1987 the Ontario Ministry of Natural Resources along with their partners for the last 10 years, the Ontario Federation, have stocked approximately 13 million Atlantic salmon. The majority of these fish were stocked in the Credit River. To date the Credit has annual returns of approximately 13 - 30 adults. Not millions of fish but 13-30 fish back to their major stocking site. I talk regularly with some of the best charter boat operators on Lake Ontario and they are lucky to catch one or two in an entire season. Remember, the State of New York stocks Atlantics too, but nowhere near the numbers, but with the same success...nothing. Now, Ontario after finding no success with decades of stocking the Credit are shifting sites to the Ganaraska. Forget that the Gany's rainbows have been on decline in recent years, let's stock 70,000 advanced Atlantic yearlings on top of the hatching wild rainbow. Watch this steelhead fishery go to hell in a hand basket. This was a real piece of scientific thinking. The Steelheaders warned the brains behind this little gem that steelhead for the most part run the rivers on the rains and after the rains when the river gets more than a little cloudy. Cameras don't show much through muddy water. One year we transported more fish in four days during our collection than the camera counted for an entire month. So much for this 'watch and see and see little' program. I think when the MNR was pulling the plug, they tried to see if any one else wanted to give it at try at the clubs' expense...No thanks! A few years back, I met with a District Manager and the Upper Great Lakes head Fisheries Biologist over lunch to suggest that it would be an idea to 'compliment' our stocking and transport program with a token 3 year stocking of Ministry steelhead. We would help collect the eggs from our wild returns and they could raise them in an MNR facility. My one suggestion / stipulation was that they stock the yearlings at Walkerton, far downstream of the Maple Hill turbines. To my surprise they did accept the idea of the proposal. Eggs were collected and raised at Chatsworth and Normandale. For the last three years these fish have been given special quarantine, testing for disease and other comparisons with their hatchery brood stock strains. Our fish passed with flying colours. I made the suggestion that they keep a thousand fingerlings of each year’s collection for their own brood stock program. This idea was given a thumbs down. Even worse, for each of the past three years the fingerlings from government hatcheries were stocked in the Beatty. From the first stocking until today approximately 30,000 fish each year have had to survive a trip through turbines when the water is low. Some years enough water is going over the dam and a fair percentage of these stockers will migrate downstream. In most instances though (like the day in late April) with our guests, there is no flow or very little going through a so-called bypass to give them safe passage. Most will go through the turbines. At least that is, go through the turbines with most in pieces. The little guys from our adult transfers to the Beatty face the same hazard, but our fish are 'wild' having been born in the river and surviving on their own for a year or more in the Beatty. There's a big difference between being born and feeding in a hatchery for 12 months and our 'wild' smolts. I received a call one day from an MNR staffer asking if he could borrow one of our fish transfer tankers. I asked why and the answer was he planned to do a little experimenting and underwater filming on steelhead movement. I agreed and at the time figured is was to 'monkey' with Maple Hill. Well we lent the trailer and I guess the underwater propaganda was completed. Now anyone can play the game. I would imagine the test fish were released at the entrance to the bypass channel and it was all filmed and shown around. Remember I've been in the camera game a long time. Put the fish where they will find the entrance and turn the camera on. Remember, under most conditions the majority of fish, even days before the opener are headed down the turbines on their way to extinction. Thanks again to everyone especially the Old Boys. Anyways guys, like I said, my 10 years are up. It's been great working with men like Rod Jones, Karl Redin, Pete Gilles, Grant McAlpine and his old boys as well as what seems like a hundred other concerned 'anglers' on this experiment that in my mind is a 'miracle'. Remember this. About 45 to 50 percent of the fish are wild. I know a little bit about fish and these wild fish are for the most part out of the twice a year transporting program. Which for the most part is funded by the Ontario Steelheaders and laboured by hard working old boys. Even if the MNR does let them get back in the game 5 years from now, too many of the boys won't be around. It will be difficult to start up and train newbies. You won't see the effects of this idiocy for about 4 or 5 years due to the time it takes for the 'wild' fish to hatch, grow in the Beatty, smolt out and return as adults. For the time being enjoy your fishery, but remember this latest move to cancel the program will come back to haunt the MNR and hurt the fishery. Now they plan on counting fish to determine what’s wild and what’s stocked. How are they going to go about this? Well for starters I can only see putting electro-shocking gear in the hands of scientists and the inexperienced. I doubt they’ve ever read the studies that show that repeated shocking of fish kills and manes you wild fish. They will never be able to cover the entire stretch of the Beatty from Hanover to Highway 6. Counting fish at fishways won’t work, because the biggest obstacle at Maple Hill only allows a few fish to pass. Then there’s Denny’s dam and the volunteers. Well they’ve just been told they’ve been turfed. There is not one spot on the river where even a small percentage of fish can be trapped and checked. Don’t be surprised if they ask to borrow a trailer, ask for some Kincardine unclipped hatchery fish and play the propaganda game. One doozy of a screwed up experiment. Too many people in the Ministry even today are more worried about holding their jobs and getting their name on a paper...and not the fishery or what has been accomplished. Think real hard. 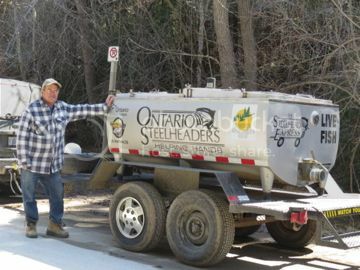 The boys of the Ontario Steelheaders working the trailer program asked for nothing, except to improve the fishery and that includes the boys working the lifts as well. 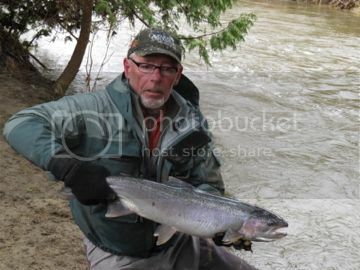 It was at no cost program except to the Ontario Steelheaders. This new idiocy will only hurt and not improve. Get ready for a new propaganda campaign. You can expect more films and twisted presentations will be shown at a club house near you. Closing out I would like to say thank you to Kathy Dodge and past District Manager Kevin Hawthorne for having faith in our work and helping to get this program to what I refer to as the miracle on the Saugeen. As for some others within the ministry I can only say keep experimenting, I’m not surprised. Nothing you do surprises me. Enjoy the next few years of fishing, because in a few short years it is only going to get worse.